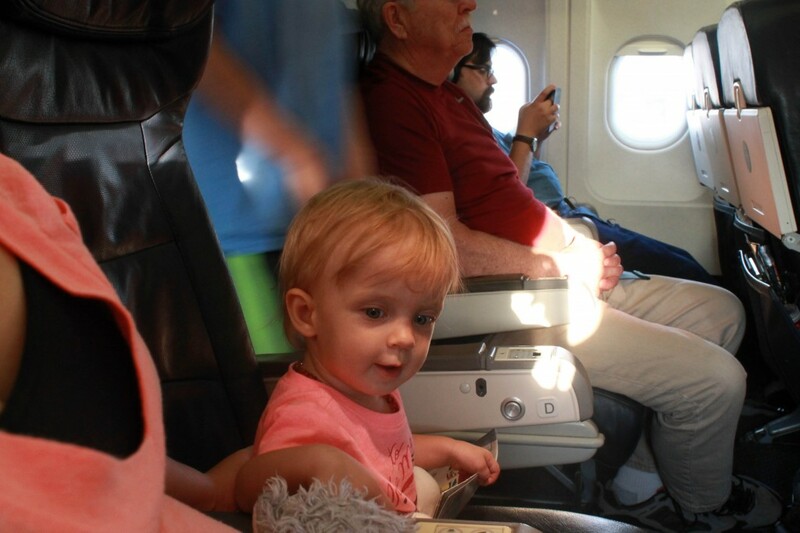 We just returned from a whirlwind trip to Central Virginia and I honestly had no idea what to expect when it came to entertaining Edith on a 5+ hour flight. I didn’t want to load my new and extra large diaper bag up too much since I was going to have to carry it around but I also didn’t want to be without toddler (!!) entertainment items. 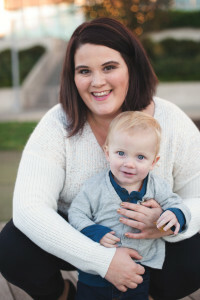 Although there are some similar items in my travel diaper bag as my everyday diaper bag there are also a lot more books, toys and travel items as you will see. Wallet because of course mama needs to have her license and money to pay for things. A snack because traveling makes me hungry. Keys because I have a great pocket to stash them for our trip. iPad Mini: this is really for myself and Edith. I have free movies loaded up for myself and a few fun apps for Edith. Travel Tote: I love to carry these totes just in case I need a bag to carry something. Packets and Snack: Due to TSA regulations I had to find myself packets that were 3.4 oz or less. Since our usually packets are 4oz I was a little disappointed we couldn’t bring them but I did find a few good Plum Organics grain and berry blends. I also had an Ella’s little fingers for E to munch on. Water Cup: Empty of course until we get past TSA security. Snack Cup: We have a few different snack cups but currently this OXO Tot Formula Dispenser is my favorite one. Like I said in my last diaper bag post we have never used formula but this dispenser is awesome because it has three compartments making it great for stashing three different snack options. This trip the dispenser contained freeze dried strawberries, mango and banana and graham cracker bites. Surface Wipes: Dapples toy and surface wipes are awesome for cleaning those toys that inevitably fall onto the airplane and airport floor and are wonderful for whipping off tray tables. OXO Tot Bib and Fork: I usually bring a spoon too but I couldn’t find ours so just a fork this trip. I have to say this bib has easily become one of our most used diaper bag items. It rolls up, it is easy to clean and the pocket is awesome for catching food that falls from Edith’s hands or mouth. 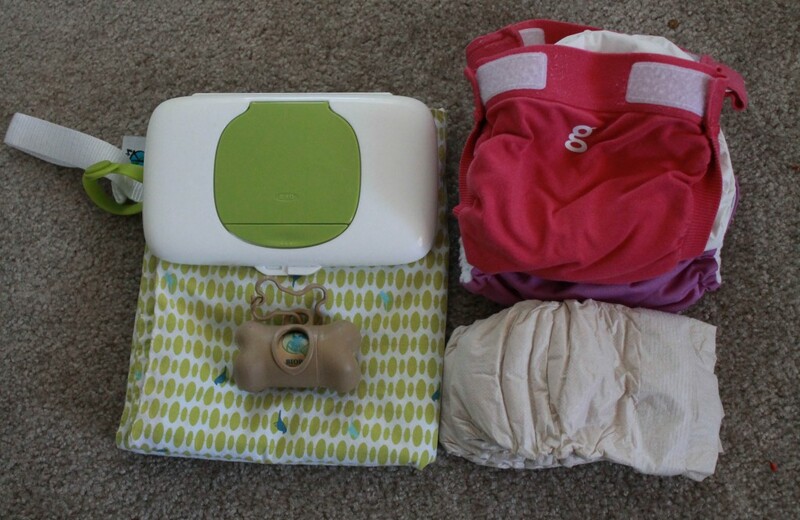 Diapers: For this trip I brought a few disposable and our entire stash of gDiapers with disposable inserts. 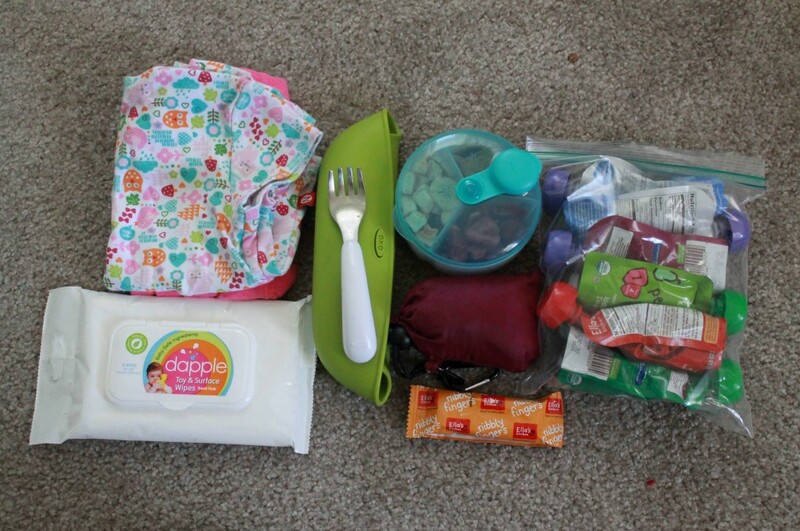 Wipes: I am in love with the OXO tot On The Go Wipes container. This new addition to my diaper bag holds a good amount of wipes and is super easy to use. I only had to refill the On The Go Wipes container once on our weekend away! Wet bag: for gDiaper covers and liners to be stored. Doggie Poop Bags: Yeah you read that right. These are fantastic because I can easily dispose of the gDiaper inserts or disposable diapers. 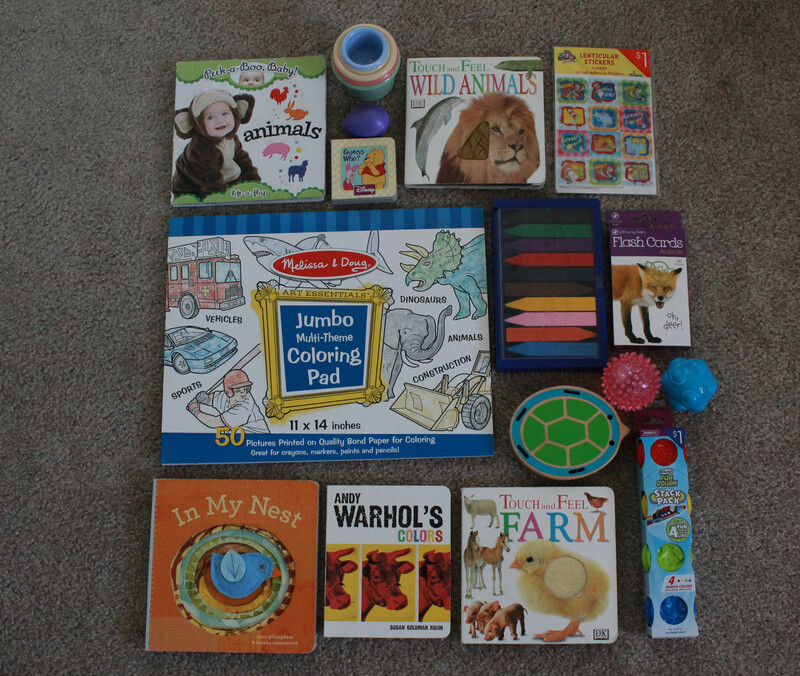 Entertainment: I brought a number of Edith’s favorite books and a few new ones, stickers, stacking cups, egg shaker, a few coloring pages from this book shown, crayons, animal flashcards, play dough, a wooden turtle, and bouncy balls that light up. Edith’s Birth Certificate: Just in case. A muslin blanket: for semi-discreet nursing on the plane and as a blanket for a a hopefully sleepy baby. Sweaters for the family: Since planes tend to be cool at times I had a light sweater for each one of us. Later this week I’ll talk more about what we actually needed and some of my travel tips but for now this is what I brought with us. 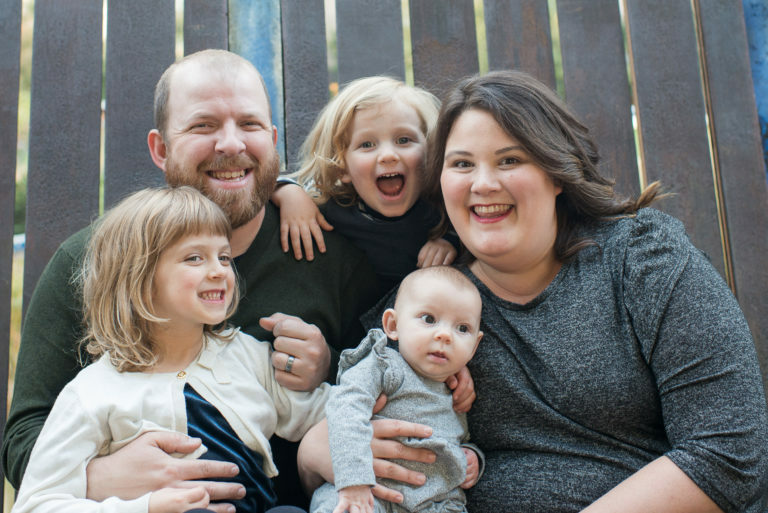 What are your baby/toddler travel essentials? Need great on-the-go tot solutions? Enter to win $70 in gear from OXO tot. Great post! Just an FYI, TSA updated their restrictions for baby food, breast milk, etc. (http://www.tsa.gov/traveler-information/traveling-children) And you are definitely allowed to bring over 3.4 oz pouches of baby food. We always bring Happy Tot brand for our little girl when we travel and haven’t had any problems! Good to know! I wasn’t sure if it applied to packets or just small jars of baby food and formula. It worked out fine for us in the end anyways! We use 7th Gen wipes. Not the tubs though because those tend to get all dried out fast. We also sometimes use Whole Foods brand. At home we use cloth though. want to take something that will fit under the seat. Do you have any suggestions?